Pico de Orizaba the highest mountain in all of Mexico towers 18,800 feet above the city. Isolated villages tucked among the majestic peaks of the snow capped volcano are home to a people that trace their ancestry back to the Aztecs. A stark contrast to the bustling city streets and shops packed with townsfolk. The colorful municipal market hums with activity as merchants stock their stalls with the most amazing array of fresh produce, farm cheeses, and freshly slaughtered meats and poultry. 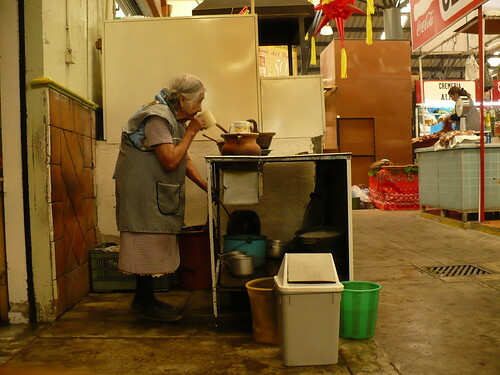 Mesmerized I watch an old old woman stooped over a simmering clay caldron, she stirs the brew with a wooden spoon as ancient as she. A deep red sauce bubbles to the brim, a delicious aroma fills the air, enticing me to try a bowl of the steaming pork adobo. So rich and satisfying it warms my soul, the old woman nods approvingly as I dig into my hearty breakfast. We explore for three days following the rushing river that courses through town, each side bordered by crumbling whitewashed buildings. There is a feeling of decay about this place that contrasts sharply with the modern merchandise displayed in shop windows and the throngs of fashionably dressed teenagers, cellphones in hand. 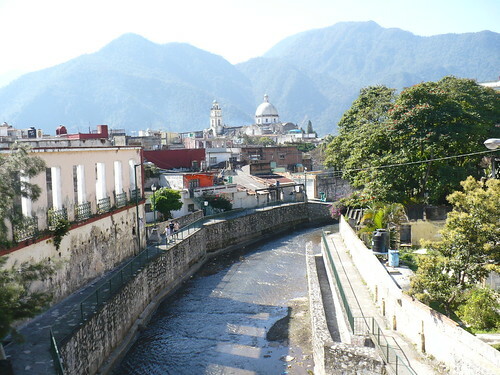 Sadly we must bid adios to Orizaba. Time to catch a bus out of town. We enjoy traveling on Mexican buses; first class tickets are inexpensive and you can count on clean, comfortable and punctual service. We lean back in the seats and wile away the hours reading, watching old American films or gazing at the ever-changing landscape rolling by. This station is modern and spacious, reverberating with all the commotion of a well-run travel outpost. We buy our tickets, but with time to kill before departure wander over to a nearby restaurant. Young waiters in starched white shirts serve the house specialty, Mexican BBQ. The requisite salsa and chips is brought promptly to our table. We dip into the sauce and are immediately surprised by a unique subtle flavor that we can’t quite identify. Our waiter tries to explain the concoction as we nod perplexed. Shyly he returns to our table with a paper napkin, the ingredients printed neatly in Spanish. Aha! Cachuate! (Peanuts) is the secret ingredient. Carefully I fold and stash the napkin for the long trip back home. 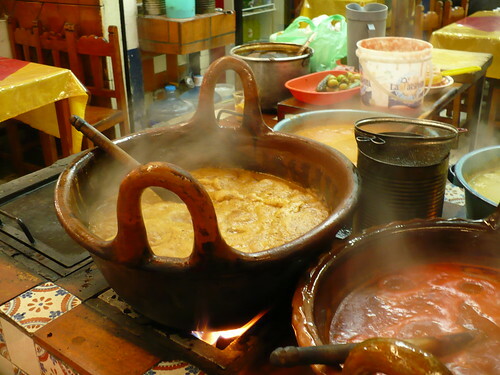 This entry was posted in Travel & Culinary News, Salsa and tagged mexican recipes, mexican travel, orizaba mexico, peanut salsa. Bookmark the permalink.